Sixteen year old student Jamie Margolin had always been interested in creative action against climate change. Just last year, she developed a multidimensional, youth-fueled response to climate change aptly entitled Zero Hour. Today, Zero Hour is a full scale, national movement that is also gaining traction abroad. 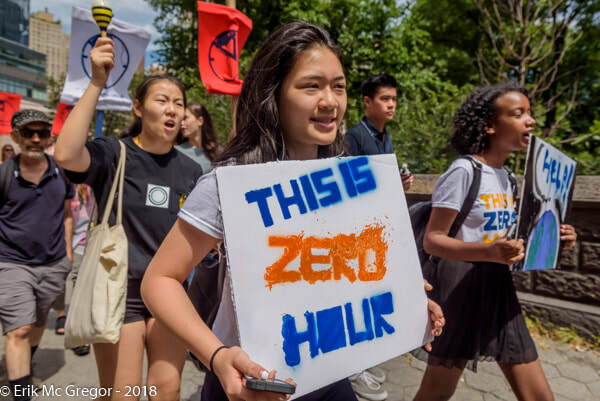 Inspired by Margolin’s activism, then-high school students Ilana Cohen and her friend Amy Torres established Zero Hour NYC. 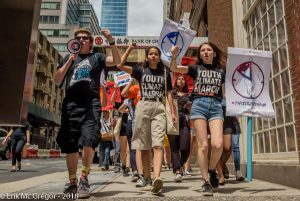 Core to the organization’s mission is inclusivity and interconnectivity: its mission underlines that not only youth, but also those “of the Global South, People Of Color, Indigenous Peoples, People with Disabilities, Poor People, Women, Queer and Trans People, and People belonging to marginalized faiths” are all those who are on the frontlines of climate change and are therefore uniquely poised to co-lead positive social change for both planet and people. Zero Hour NYC is well positioned to demonstrate Margolin’s vision of inclusivity. Amy Torres and Ilana Cohen, along with a robust and diverse team, oversee New York City’s own coalition of local city students who are working collaboratively to ensure a more sustainable future for all. On July 21st, Zero Hour NYC hosted its first Youth Climate Change March. Hundreds of co-organizers, activists, peers, adult allies, and organizational partners marched from Columbus Circle to Dag Hammarskjold Plaza by UN Headquarters, where they held a historic rally. The march this weekend was distinctly multi-generational, multi-ethnic and cut across economic lines.